ACTA – Anti Counterfeiting Trade Agreement – Horribly Wrong. Well, if you haven’t heard of ACTA yet, its cause the participant governments don’t want you to hear about it. Its being drafted currently (and has been for several months) to ‘prevent piracy’, but it has much more significant implications overall. Under the pretext of fighting true counterfeit products and commercial piracy that causes actual significant loss to both right holders and consumers, it seems to target more specifically the everyday citizen. Provisions for judicial authorities to pay the right holder(s) fines: Arbitrary, trial-less punishment, ACTA would allow government officials to force you to pay fines based on already shoddy laws under the pretext of ‘terrorism’ or other bandwagons. Provisions for confiscation and destruction of IP violating property. Wouldn’t this let them take, keep and suppress any evidence for you to fight their decision? Doesn’t this make a small group judge, jury, and executioner without any oversight? I already mentioned the lack of transparency in the Canadian government by removing certain programs which allow for people to watch the government. Disclaimer: IANAL, this is only an informative statement towards the public. I felt I needed to put that disclaimer in because sooner or later, any public outcry against government policy will be illegal. If there is a definition of irony, Slashdot appreciates it. Also, link to the article. Well, I recently got a shiny new heat gun, and decided to take it to a old Bay Networks token ring hub – a really old 1.5U paperweight^W boat anchor. The basis of heat gun salvaging can be found here, but to sum it up in a few words, take a heat gun set to 450degC – 500 degC, apply heat gently until solder melts, and remove part with pliers. In some cases the part can be heavy enough to fall out under its own weight or if the board is shaken enough, but in general pliers seem to work the best. Various connectors, headers, a few switches. 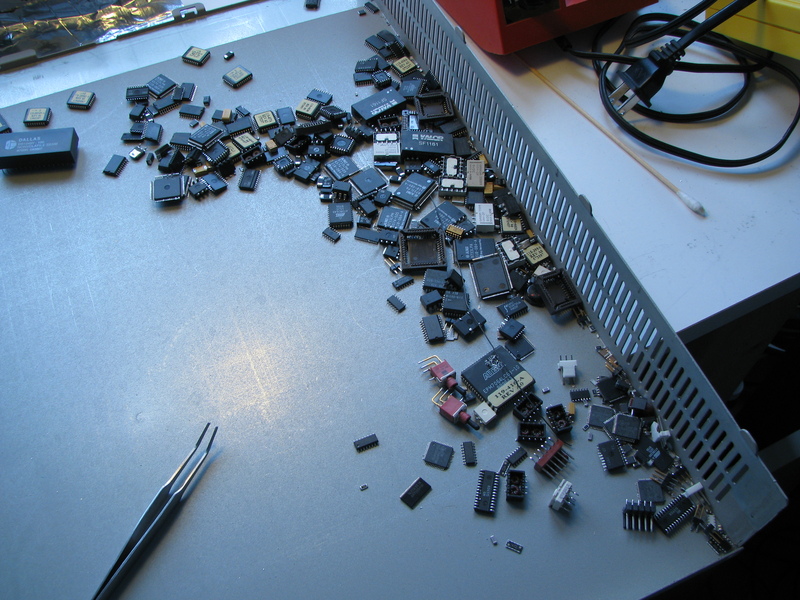 And I didn’t even salvage *all* the components, I just got lazy and salvaged most of the useful ones and avoided the ASICs or obsolete controllers for token ring, although I *do* have a large stack of token ring controllers which may make good 20kv capacitor bank fodder. I started this hack after salvaging a gigantic ghetto token ring hub using a heat gun, and having dozens (read near a hundred) SMD IC’s which needed to be sorted, and my tweezers were simply not up to it. Knowing that real vacuum tweezers can cost more than the budget of hobbyists, I thought of a nifty way to make vacuum tweezers on the cheap. So for those of you that don’t follow the news too closely, the PM of Canada has shutdown a important database that was designed and implemented to allow the government to be transparent. The basis of CAIRS is that it tracks who searches for what (by department, or if it was a public request). As of April 1st departments didn’t have to update the database, and its just another drop in the bucket towards removing government accountability. Consider signing the petitions after reading the news articles and understanding what it is at work. UPDATE: The Globe & Mail published a news article saying that the Commissioner’s Office (think independent oversight) was not notified to the government’s action of stopping monthly updates of the CAIRS database. The independent oversight provided by the Commissioner’s Office is supposed to provide an objective view on decisions like these.